I'm on a mission to build a soap named for my late father. I've worked up a scent profile that includes a number of scents and idea's that I associate with his life and likes. There's aspects of the base that are consistent with those ideas as well. 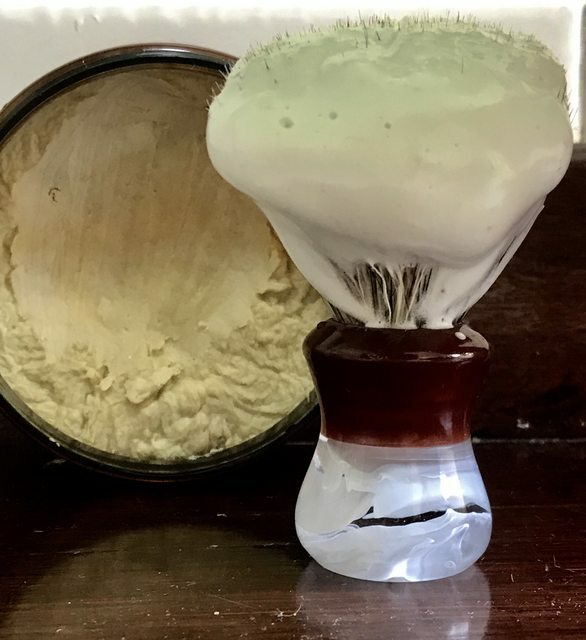 I am very happy with the test scent I built (family likes it too) but as usual when I apply it the soap base it has changed, mainly because I've included Tamanu and Hemp oils in the base which has dampened down the scent and added a pudding note. I'll let the soap sit for a while to see how it settles but I also think I'll be doing further iterations before I settle on something to put a name to. I'll be reluctant to remove the Tamanu and Hemp as they contribute to a beautifully rich and creamy lather. Ingredients: Stearic Acid, Tallow (Beef), Tamanu Oil, Hemp Oil, Emu Oil, Rosehip Oil, Coconut Oil, Castor Oil, Shea Butter, Apricot Oil, KOH, NaOH, Filtered Water (RO), Glycerine, Kaolin Clay, Tussah Silk, & Essential Oils. Essential Oils: Grapefruit, Vetiver, Thyme, Clove, Rose, Labdanum, Cinnamon. Lathered nicely and shaved well. I was so happy with the scent so I thought I'd have this project finished much quicker than initial expectations. I was wrong. Just as well there's no rush or deadline. I don't think Dad is going to mind.